Shwegutaung pagoda stands on the hill in the east of the palace site. The pagoda was built in the east of the palace, and the successive kings of Mraukoo worshipped that pagoda as a palace-head pagoda. The pagoda was built by king Min Saw Mon is AD 1430. The pagoda has three levels of the pagoda court in the west of the hill. There is a wall containing eight small caves in the lowest level. The peacock figures exist between every two small cave. 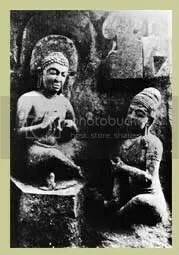 In the previous time, the Buddha image cast in nine jewels, was in the cave. In the present, that Buddha image is dwelling in Nyaungpin Market monastery to be worshipped. The pagoda has a cave at the base and in the previous time, the cave had the bell-shaped pagodas. Each of the small pagodas is at the four corners. The small caves adjacent to the wall, are in the south, the north and the west. The British chief commissioner Mr. Aran Hal built a conical pagoda on the cave in AD 1937. The original upper part of the pagoda had been in ruins, but the board of trustee renovated it. The flat stones laid on the court in order to perform Buddha Puziniya dance, can still be seen in the eastern pagoda court. Shwegutaung is one of the nine big caves in Mraukoo. The board of trustee takes care of the pagoda.